What Was Cain’s Problem, Anyway? Why did Cain kill Abel? What was his problem? How did his envy turn into murder? More questions. Why was God so hard on Cain? Why was Abel’s sacrifice pleasing to God, but Cain’s was not? Didn’t they both offer goods from their livelihood? I don’t read anywhere in that context that somehow an animal sacrifice was more acceptable than a sacrifice of produce, do you? Since faith comes by hearing (Romans 10:17), before Cain and Abel made their sacrifices, God must have told them what would please Him and what would not. It’s subtle, but that explanation partially satisfied me. However, a recent reading of the text gave me a different insight into the real problem. It wasn’t only Cain’s gift that displeased God, it was his attitude. Note the “and” in verse 5: “…but on Cain and his offering he had no regard.” It wasn’t merely the offering that didn’t please God, it was also Cain! His offering – maybe not even the best of his crop – was not acceptable to God. But Cain’s offering was only a reflection of his weak character. Cain’s response to God’s warning indicates that – because of Cain’s attitude– any gift he gave wouldn’t have pleased God. Because we’re also subject to human passions and foibles, we would do well to note the flaws in Cain’s character that led him to do the unthinkable – murder his younger brother. Cain compared himself to Abel and came up short. “And the LORD had regard for Abel and for his offering; but for Cain and for his offering He had no regard” (Genesis 4:4-5). God’s favor upon Abel and his gift had nothing to do with Cain. God’s displeasure with Cain had nothing to do with Abel. God could have been pleased with both gifts! Yet Cain saw only that Abel’s gift was accepted while his was not. Cain had a short temper. “So Cain became very angry and his countenance fell” (v. 5). Cain’s first response? To become angry and make sure everyone knew it. He didn’t ask God what he could do to please Him. Self-absorbed, his only thought was that he had been slighted. How could his younger brother be acceptable while he was not? Cain wouldn’t listen to God’s instruction. God gave Cain a second chance. “If you do well, will not your countenance be lifted up?” But Cain didn’t want to do well. He didn’t want to listen or to change. He wanted God’s favor without doing what was necessary. Cain wouldn’t heed God’s warning. 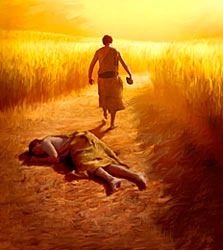 “…if you do not do what is right, sin is crouching at your door; it desires to have you, but you must master it.” God warned Cain that if he didn’t stop focusing on his imagined hurt and decide to do what was right, his desire to sin – to do wrong – would take over. Cain showed no remorse. When God pronounced his punishment on Cain, Cain’s only concern was for himself. “My punishment is more than I can bear. Today you are driving me from the land, and I will be hidden from your presence; I will be a restless wanderer on the earth, and whoever finds me will kill me” (vss. 13-14). None of us can imagine that our envy would ever turn to murder. But Jesus taught that we don’t have to commit murder to be guilty of it, we have only to hold on to our anger. You have heard that the ancients were told, ‘You shall not commit murder’ and ‘Whoever commits murder shall be liable to the court.’ But I say to you that everyone who is angry with his brother shall be guilty before the court; and whoever says to his brother, ‘You good-for-nothing,’ shall be guilty before the supreme court; and whoever says, ‘You fool,’ shall be guilty enough to go into the fiery hell (Matthew 5:21-22). Let God’s warning be a warning for us: Sin desires us as much as it desired Cain. We also can lose our sense of what’s right and what’s wrong if we give in to our baser feelings. We also can give God mediocre service, supposing He will reward us anyway. We can compare ourselves with others and resent them for their successes. We can give into our anger, turning it into hatred. We can let sin have us.